In Leonardo da Vinci’s The Last Supper, Judas Iscariot can be seen to the left of Jesus, holding a small silver bag in his right hand. There is also a spilled salt container in front of him, a sign of bad luck. St. Jude is second from the right, next to St. Simon. Da Vinci intended this painting to depict the moment Jesus tells the Apostles he will be betrayed by one of them. In the fourth Gospel, before John writes about the Last Supper in Chapter 12, he introduces Judas in Chapter 6: Then Jesus replied, “Have I not chosen you, the twelve? Yet one of you is a devil!” He meant Judas, the son of Simon Iscariot, who, though one of the twelve, was later to betray him” (John 6:7071). In the Book of Matthew, Judas asks Jesus: "Is it I, Rabbi?" and Jesus replied: "Thou hast said it" (Matthew 26:25). The Gospel of John tells us: Jesus answered, “It is the one to whom I will give this piece of bread when I have dipped it in the dish.” Then, dipping the piece of bread, he gave it to Judas, the son of Simon Iscariot. As soon as Judas took the bread, Satan entered into him (John 16:2627). Judas’ betrayal lead the chief priests (also known as the Sanhedrin) to Jesus in exchange for 30 pieces of silver. 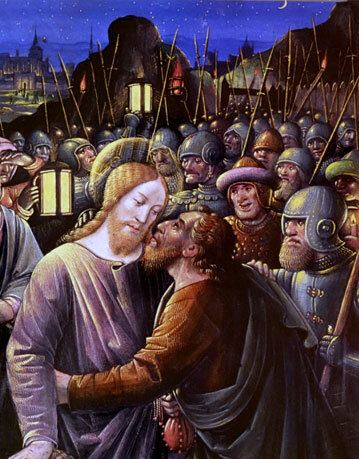 Judas identified Jesus in the garden of Gethsemane with a kiss on the cheek. His betrayal of Jesus is unique in that Judas was not confronted by the chief priests and pressured into betraying Him; he approached them on his own: Then one of the twelve—the one called Judas Iscariot—went to the chief priests and asked, “What are you willing to give me if I deliver him over to you?” So they counted out for him 30 pieces of silver. From then on Judas watched for an opportunity to hand him over (Matthew 25:1416). The Gospel of Matthew tells us that Judas regrets his actions and tries to return the money to them: “I have sinned,” he said, “for I have betrayed innocent blood.” “What is that to us?” they replied. “That’s your responsibility” (Matthew 27:4). Matthew is the only Gospel writer to tell us of Judas’ fate after the betrayal in the Garden: So Judas threw the money into the temple and left. Then he went away and hanged himself (Matthew 27:5). After the Resurrection of Jesus Christ, the Apostles selected another man to take the place of Judas: “For,” said Peter, “it is written in the Book of Psalms: ‘May his place be deserted; let there be no one to dwell in it,’ and, ‘May another take his place of leadership’ ” (Acts 1:20). After praying, they chose Matthias to complete the twelve. Judas remains a controversial figure. While he is viewed as a traitor, Jesus is known for forgiveness. The Gospel of Judas, a Gnostic text, says that Judas was asked by Jesus to be handed over to the Sanhedrin, which would cause Jesus’ spirit to be set free, therefore ascending into heaven. By doing so, Judas would be given a place in heaven. While Catholics reject this way of thinking, there is no doubt Judas felt guilty after what transpired. Today, Judas symbolizes betrayal in both art and literature, as well as in popular culture.